The process of voiding of urine from the bladder is called micturition. It is a reflex phenomenon. The filling of the bladder occurs by a pair of ureters, which arise from the pelvis of the kidney. The urine is transported in the ureter by the peristaltic waves, which are generated from the pelvicalyceal junction. The distention of this region by the presence of urine forms the stimulus for the initiation of peristalsis. The urine as it flows along the ureter, does not show any change in its composition, as the ureter is lined by transitional epithelium. The ureter ends in the bladder and the junction is known as ureterovesical junction. About 2 to 3 mm length of ureter at its termination, is embedded within the bladder muscle, which ends obliquely at the posterolateral angle in the bladder. This anatomical arrangement prevents reflux of urine into the ureter, when bladder contracts during micturition. The contraction of bladder raises the resistance at the termination of ureter and hence no reflux of urine .Juxtaglomerular apparatus into it takes place. The bladder contains a smooth muscle called detrusor. Its arrangement in the bladder forms the trigone. The detrusor continues as bladder neck and forms the internal sphincter. The posterior urethra at the urogenital diaphragm, shows a somatic muscle, which forms the external sphincter. The bladder and the urethra are supplied by the autonomic nerves. The sympathetics arise from T12 , L1, L2 and travel in the presacral nerve. The ureter, bladder and the internal urethral sphincter are innervated by it. The sympathetic stimulation causes inhibition of the bladder and contraction of internal urethral sphincter. The pain impulses from the bladder and urethra is also carried by the sympathetics. The parasympathetic innervation arises from S2, S3 and S4 segments of the spinal cord and the fibres travel in the pelvic nerve. The stimulation of the pelvic nerve causes bladder contraction and relaxation of internal urethral sphincter. The external urethral sphincter is supplied by a somatic nerve called pudendal nerve, which arises from S2, S3 and S4 segments of the spinal cord. The process of micturition although a reflex one, involves social and cultural factors. The bladder is normally under the central inhibition and during micturition this central inhibition is removed. The lowest center is the sacral segments. Higher centers are present in the midbrain, pons, hypothalamus and cortex. The sacral center can produce the reflex, only when the higher centers inhibition is removed. Bladder filling causes stretching, which forms the stimulus for the reflex. The afferent and efferent impulses are carried in the pelvic nerve. Rise in volume up to 100 ml, raises the pressure in the bladder to 10 cm of H2O. Further rise in the volume, i.e, from 100 to 400 ml, does not show a corresponding rise in the intravesical pressure, due to the property of adaptation. The plasticity of the bladder muscle is responsible for accommodating the large volume with little rise in pressure. If the volume rises above 400 ml, the adaptation mechanism fails and the reflex contraction of the bladder occurs causing rise in the pressure. Experimentally, this relationship between volume and pressure in the bladder can be studied and the graph obtained is known as cystometrogram. The desire to void urine occurs around 200 to 250 ml of volume. If a suitable place is found to void urine, the central inhibition is removed and the sacral segments produce the reflex contraction of the bladder. The contraction of the bladder and the relaxation of the internal sphincter are caused by the pelvic nerve. The presence of urine in the urethra reinforces the reflex mechanism. That is, the bladder contracts continuously as long as the urine is in the urethra. This ensures complete emptying of the bladder. The presence of urine in the urethra also causes inhibition of pudendal nerve and the external sphincter relaxes. Since this is a somatic muscle, it is under voluntary control. It is possible to stop micturition voluntarily by its contraction. The inhibition of external sphincter allows urine to be expelled outside. 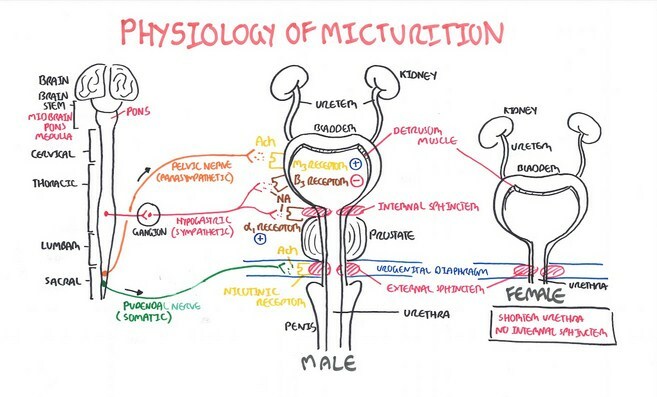 During micturition, respiration stops. The straining efforts increase the intraabdominal pressure, which augments the intravesical pressure, facilitating micturition. Sectioning of pelvic nerve, or spinal lesion involving sacral segments, results in paralysis of detrusor muscle. The micturition reflex will be absent in such conditions. Ability to hold the urine in the bladder is lost (incontinence). Overflow incontinence results. The bladder contracts with smaller volumes, on its own, which is known as automatic bladder.